I came to CHESS as an outsider. Everywhere I met old friends, longtime environmental historians, eyebrows shot skyward. I’ve never been known for any particular interest in the environment, and one colleague cynically suggested that I was really in Toronto for the Berks. No, in fact, I’m genuinely struggling with questions that wend their way towards environmental history and processes of nineteenth-century suburbanization (and, indeed, always have done while wearing my non-Canadianist hat). I am currently working on a history of taxation in Canada, 1867-1917 that requires I seriously consider the emergence of the administrative state. Perforce, my project explores the kinds of things people demanded of their local governments, and I discovered that the logic of that particular statist reasoning was, above all, one of mutual adaption between people and the environment. I want to know when and how people began to ask: is X a place where people can live as social beings? Can the ordinary physical business of living be carried on successfully, healthily, here? How does government help or hinder that process? And threading through my discussion of such processes of liberal self-government, I juxtapose the government of Indigenous peoples, which was in many respects a paradigmatic space for reflecting on what healthy living and government looked like under suburban conditions. I find, in the middle decades of the nineteenth century, a fascination with constructing Indigenous villages as a motor of civilization, albeit a fascination that largely faded after the annexation of western Canada, during the shift from a policy of civilization, directed at communities, to a policy of assimilation, which was much more individualized. But, even as I gleaned much new information on that question, over the course of the weekend I found that CHESS spoke much more powerfully to other questions around the taxation project and, above all, the concern with inequality at its heart. Chris Sellers gave a fascinating keynote address that clearly laid out the importance of wealthy suburbs and suburbanites in cultivating environmental conservation. Amongst his many arguments was a contrast between Levittown, which grew steadily less green, and Long Island, which grew, if anything, greener. In other words, even as the overall quotient of conservation increased, it served the wealthy elites more than it did their social and economic inferiors. It clearly tracked the model that Thomas Piketty has been making for capitalism as a whole. In his Capital for the Twenty-First Century, Piketty charts the emergence of a patrimonial middle class investing in property, but then shows that the truly rich do other things with their money, and get far better return on their investments than do other classes. That is to say, as with environmentalism, capitalism as a whole benefits the wealthy elite more than the common mass of people. There seems to be some sort of Malthusian divergence between mathematical and exponential returns on investment in the economy and the environment alike. 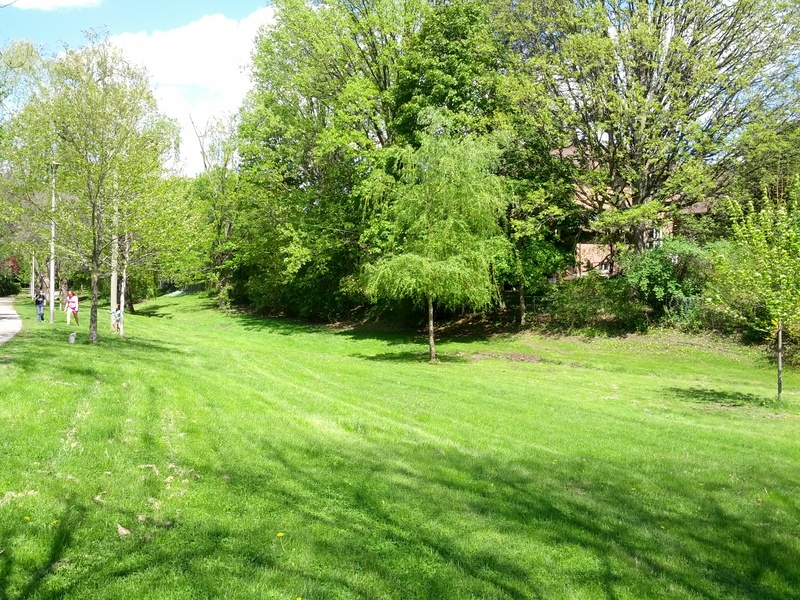 Green space behind houses in Don Mills. A perfect exemplar of that divergence, it seemed to me, was conveyed by walking through the long, green stretches behind the houses at Don Mills. The planners determined to create communal green spaces where children could play, families stroll, square in the middle of the bungalows and duplexes. These green spaces, which had, according to Richard White, CCF-style, social-democratic politics behind them, sustained a communal public space to counteract the privatization of domestic life that the suburbs seemed to nurture. Again, according to Thomas Piketty, over the twentieth century, intellectuals, cultural workers etc, sustained a sense of public and common good by aggressively attacking economic and social inequality as an enemy to that common good. They built a welfare state through progressive taxation, that is, taxation that rises as wealth rises. But at the end of the twentieth century, neoliberal governments began to relax their tax regimes, as tax breaks and loopholes effectively gutted progressive tax regimes. They ring-fenced their own wealth, all the while continuing to draw upon public investment into infrastructure, funded by the community as a whole. And similarly, dotted amidst the bungalows and duplexes with their pretty gardens and low fences, were newer, larger mansions, with high fences to effect more deliberate and complete separation of public and private spaces. Public will in favour of environmental conservation and the sense of a public good more generally must, I think, go hand in hand. But there’s a political tension between benefit to the good of the whole and disproportionate benefit to the wealthy, and that tension, attacked from both the left and the right, undermines the concept of a public good, making it hard for activists to sustain campaigns for both conservation and equality. That’s the most important thing I learned from CHESS 2014. Elsbeth Heaman is an associate professor in the Departmen of History and Classical Studies at McGill University.